This category covers the coins minted from the first consulate of Caesar in 59 BC and until the Ides of March in 44 BC. While the official coins of the late Republic were still minted under the control of the moneyers, it became more and more common practice for imperators to coin their own money to pay their troops and for propaganda purposes. Reverse: Emblems of the pontificate: simpulum, aspergillum, securis (surmounted by wolf's head), and apex. 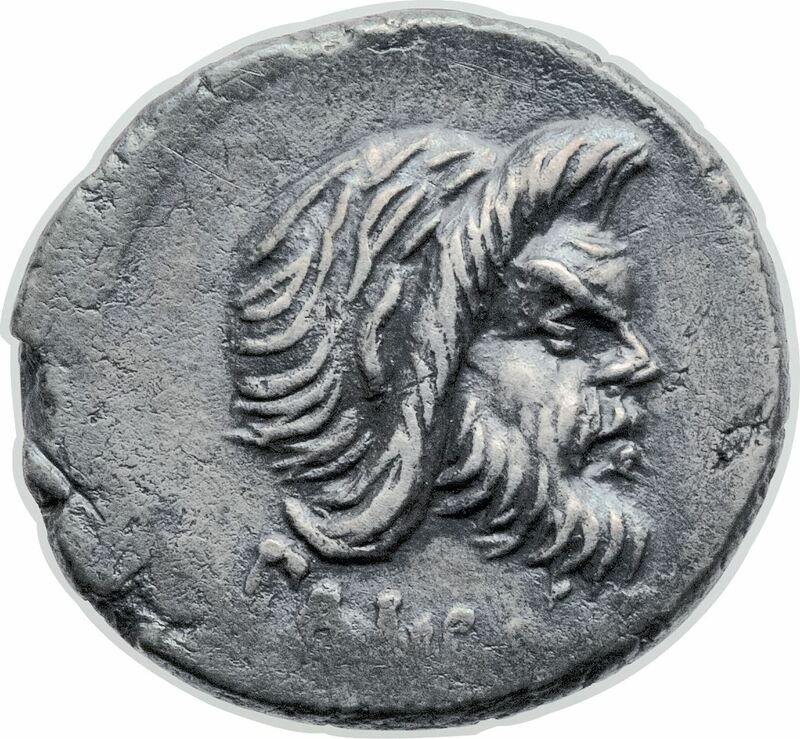 Obverse: Facing mask of Medusa with disheveled hair, coiled serpents at either side of face; L PLAVTIVS below. Reverse: Aurora, winged and draped, flying right, head facing slightly left, holding reins and palm branch, conducting the four rearing horses of the sun; PLANCVS below. Obverse: Head of Juno Moneta right; MONETA downwards in left field. Reverse: Implements for coining money: anvil die with garlanded punch die above, tongs and hammer on either side; T•CARISIVS above; all within laurel wreath. Obverse: Head of Roma right, wearing ornate helmet; ROMA behind. Reverse: Scepter, cornucopia on globe, and rudder; T • CARISI below; all within laurel wreath.